Caloocan City is one of the cities that make up Metro Manila , Philippines. It is located north of the City of Manila . It is also the country's 3rd most populated city with a population of approximately 1.3 million people. 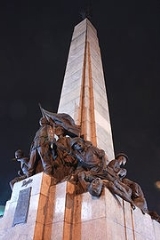 One of the cities most famous landmark is the monument of Philippine revolutionary, Andres Bonifacio, which is located at the end of Epifanio de los Santos Avenue (better known as EDSA). It was crafted by national artist Guillermo Tolentino and was erected in 1933. The whole area in which it was erected is now known as Monumento(Monument). The city hall is located on A. Mabini Avenue in the southern part of the City.